Rotary drum dryer is a kind of drying equipment for large amount of materials processing. It is reliable, flexible，applicable in drying various materials. Widely used in building materials, metallurgy, chemical and cement industry for drying slag limestone, coal, slag, clay and other materials. Rotary drum dryer mainly build by body, lifting plate, transmission, support devices, seals and other components. The dryer is a cylinder inclined slightly horizontally. 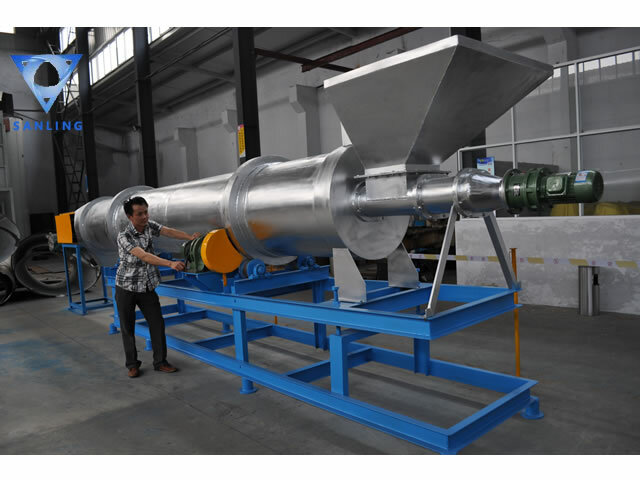 The material is fed from the higher end, the high temperature gas flows into the cylinder in parallel with the material, and the material moves to the lower end. The Parallel pick up the material and shed inside the cylinder, it makes the material and air contact surface increased, also it improve the drying rate and promote the material forward. The dried product is collected from the lower end of the drum. Anti-overload capability, the cylinder smooth operation and high reliability.